By LUDWIG VON KOOPA - KoopaTV's staffers take initial sides. Though it wasn't a Direct, we got two trailers for Pokémon Sun Version and Pokémon Moon Version! We last had news of it back in February with the 20th anniversary Direct, where people thought it'd take place in a Singapore-based region. Photobombing guy in shorts, Rowlet, Litten, Popplio. Europe gets November 23, and North America gets November 18. Apparently, the ESRB is slacking while PEGI already rated it. From that, we also get to see our playable protagonist options. 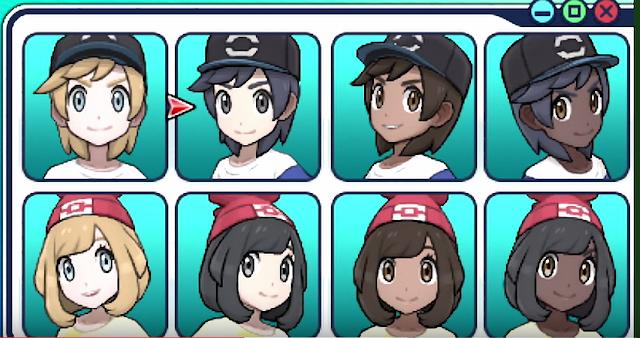 Like Pokémon X and Pokémon Y, you can choose gender and skin colour. The gender doesn't make a dramatic difference in character design this time, since their faces are the same now, like an Inkling. But the hair is also long for both. 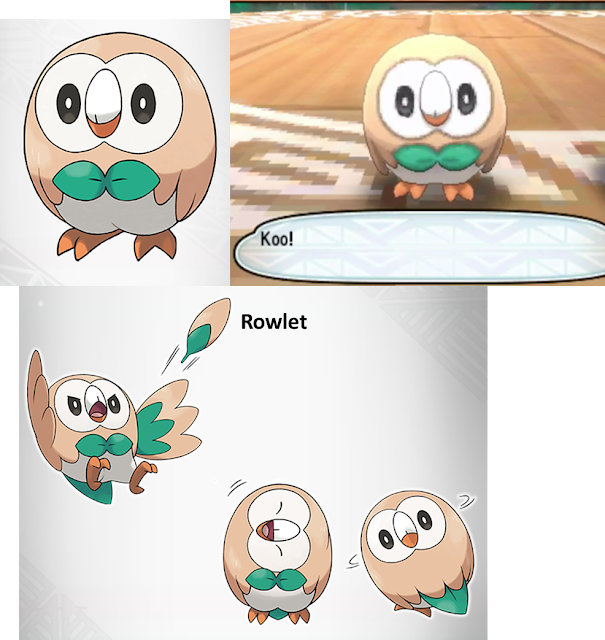 Rowlet, the Grass Quill Pokémon. I already know that Rowlet and I are destined for greatness together. It is so adorable! I WANT TO CUDDLE IT. IT'S PLUSHIE MATERIAL. It's Grass/Flying, some of my favourite types. So Ludwig is firmly on Team Rowlet. Vortexica is also on Team Rowlet, though it is tentative depending on final types and the final evolution's design. But of the three, Rowlet is the best. Kamek also likes Rowlet. Litten, the Fire Cat Pokémon. 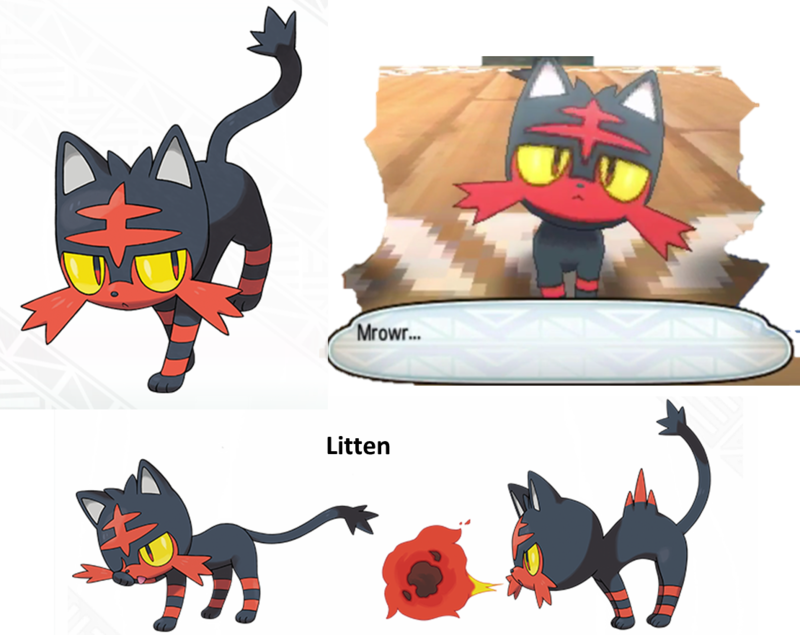 Litten is a pure Fire type. It has a hairball problem, but also shoots out fireballs. Kamek is tentatively going to pick Litten, though partially out of guilt that he's been picking so many Grass types up to now. He likes the concept. We just hope it doesn't turn into a Fighting type later on. Personally, I like Shinx more. Popplio, the Sea Lion Pokémon. Popplio is Rawk's favourite starter. (He'd prefer if it was a horse, though, and thinks Game Freak should stick to horses ala Pocket Card Jockey.) Probably because it's bullying poor Rowlet in its official artwork. 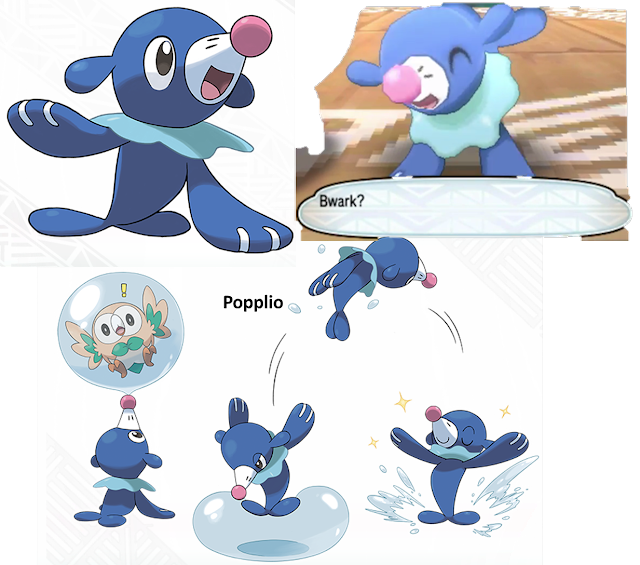 Popplio is pure Water, and seems pretty expressive. Popplio obviously likes to pose, and it can snort out water balloons, which sounds like glorified snot. Curiously, the site says its notable move is Water Gun, instead of Bubble. There are also the cover legends. Sun's is a giant fire lion, and Moon's is...some kind of crescent bat. Why do we have Litten AND the Sun cover legend? Isn't that redundant? Which starter is YOUR favourite? Or do you not like any of them? Let us know in the comments! Ludwig drew this on Miiverse of Rowlet and Wing Kirby. Please Yeah it or he'll be upset. There's more news about those cover legends: A news release dedicated to them... and a Rotom Pokédex? Treehouse Live chose Popplio as their dude to use for the E3 2016 demo. It learns Disarming Voice at level 8. 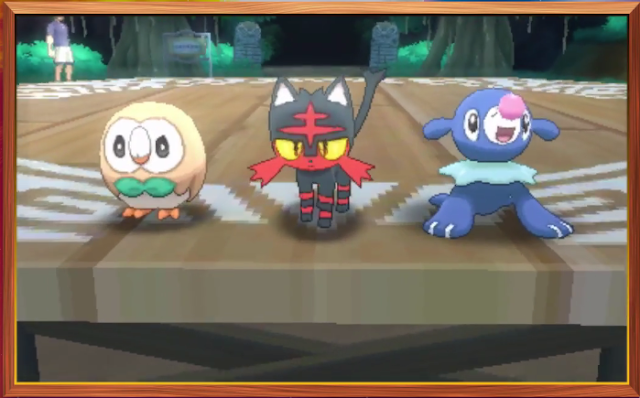 Rowlet, Litten, and Popplio ALL evolve! Here is what they now look like. You need to know the designs of the final evolutions? We KNOW the final evolutions. I'm probably going to get Sun just because I prefer the design of the cover legendary more (also my husband's name translates to "lion" in English). It's probably going to be the more popular version which means when Gamefreak inevitably advertises this in a Splatfest (you know it is going to happen), my team will lose if I choose honestly. I dunno if Splatfests will still be around by November! And it's right up against Thanksgiving, too. End the Cephalopod Cousin Waifu Wars... I mean ways to get snails forever? Yeah that is probably for the best. Also I am going for the owl. I usually always prefer grass type starters anyway. It's great the grass type starters are more varied. They used to be all reptilian and last gen we got a mammal and now a bird. Meanwhile, fire cat is joining a long line of Entei, Litleo, Pyroar, and even the Sun cover legend. I just want a donkey Pokémon. Is that too much to ask? I originally said no, but then I thought about Donphan vs. Donkeymon. Anyway, do you LIKE the owl or are you just living with the owl? I'm naming the owl after Skowl from Tropical Freeze.I do like the look of birds of prey in real life and in fiction. I named Tepig "Treif" which is sort of a Yiddish catch-all term for "nonkosher". I was sick all day so I slept early and woke up too early as a result. At least my sickness is gone now. Good that ya feel better, too. I'm also leaning toward Moon right now because I prefer the design of its Legendary. And because Litten and Sun Legendary are redundant, no? Nah, that implies two cats is too many! 2/5s of the Pokémon we know are fire cats! Don't forget Magearna and the unknown bird.